Location: Altcar Estate is situated in a country coastal location in Hooton, England. About your host at Altcar Estate, Lancashire: Team, Altcar Experience. As game shooters, The Team at Altcar understand the important elements to make a good shoot outstanding. With over a 150 years of game shooting experience combined, the individual members have shot and hunted game birds and big game in the UK, Scotland, USA, Africa, Argentina and elsewhere. Therefore we want to combine all the outstanding factors of game shooting and include them into the Altcar Estate Experience. 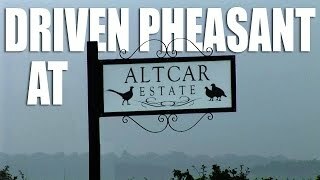 Partridge: The Altcar Estate is set amongst 3,000 acres of farmland, woodland and cover crops, with a topography that is perfect for fast partridge. Early season partridge days are excellent to warm up a line of guns, and get well prepared and practised for mixed days later in the season. The Estate incorporates a number of drives, such as 'The Withins' and 'Tin Roof' that are renowned to deliver birds that challenge even the experienced guns, but still provide excellent field sport for shooters of all levels of experience. Mixed Days: Along with early season partridge, the Altcar Estate offers excellent mixed days from late October to the end of the season. Full days of mainly pheasant, partridge, ducks along with the possibility of snipe and widgeon can be enjoyed by parties up of to 8 guns. Simulated Game: To provide the full game shooting experience and to ensure that guns get the best from their driven days, we are offering a simulated game day as part of the full week shooting package. This gives a team of shooters the opportunity to sharpen their skills, increase their accuracy and have some fun. 'Partridge' Shooting Package : £7,000 (£875.00 per gun) for 250 bird day + VAT. To select and book the top suggested hotels and accommodation in the area when shooting at Altcar Estate, Lancashire, click here. by car or public transport to Altcar Estate, Lancashire.